"Vintage style" truss rods are highly effective whether they are configured as a bending rod or simply as a compression rod. In spite of many alternative designs working around their shortcomings, the original is still often regarded as the best by many builders. Whilst I won't be weighing in on that lengthy debate, from practical standpoint "simple, inexpensive and effective" are worth the cost of entry alone. This article was written to be a suitable blend of comprehensiveness and brevity....if you remain unsure about certain areas, leave comments below or ask over in the forums. The basic tools and materials for fabricating these rods are available from more or less any hardware store, with alternatives simple to find online. The basic principle behind a single-acting compression rod is one end is fitted with (or formed into) an anchor of some sort to embed it into the neck and prevent the rod rotating. The other end is threaded with an adjustment nut and bearing washer. The far end of a compression rod can be anchored in several different ways. The only requirements are that the anchoring prevents the rod rotating in place and that it cannot be drawn out towards the adjustment nut. The simplest method is to use a readily-available component such as a barrel nut. These are used in flat-pack furniture and a standard hardware store item and consist of a short length of metal rod, cross-drilled and threaded. Simply cut a thread onto the end of your rod, screw the barrel nut all the way on and peen over the exposed rod end to secure it permanently. These cost a buck/Euro/shekel for a handful at the DIY store, or a couple of dollars for a single one from Stewmac. Some pre-fabricated rods have these brazed onto the end of the rod to better suit mass manufacture. Like most things these are simple to make, however drilling crosswise through a cylinder can present a challenge. Similar to barrel nuts, a flat piece of threaded plate or bar can be used in the exact same manner. This style of anchor is extensively found in Gibson instruments. The flat bar can be anything from a few threads thick (3mm, 1/8") to a larger block. A design found in vintage heel-adjust Fender necks is the toothed slug. 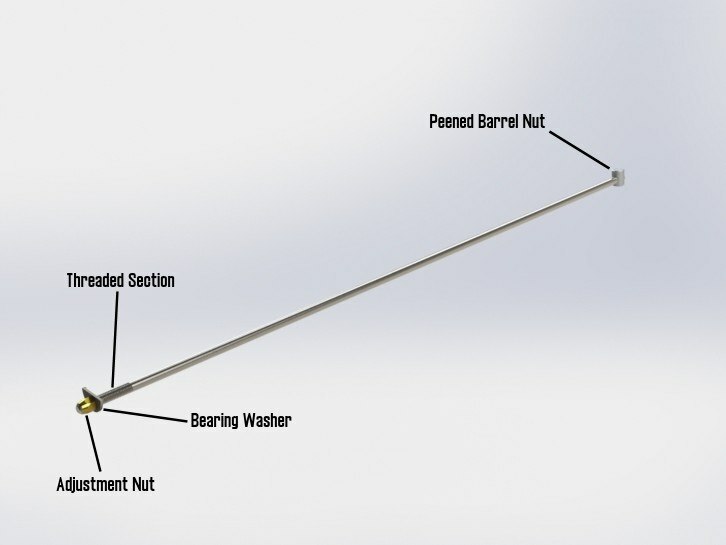 Like barrel nuts, a short length of metal rod is drilled, threaded and peened securely onto the end. In this case, the drilling is end to end as opposed to crosswise. Most Fender slugs have a milled outer surface and rely on the friction in-place to prevent them rotating. Many Fender truss rod repairs or repros "upgrade" the slug so that the bearing face has a set of teeth ground or filed into the face. These bite into the leading face of the wood, preventing the slug from rotating. These rods are generally inserted from the headstock end adjustment end first through an angled hole, down the length of the neck to the adjustment nut access hole before being sealed up with a Walnut plug. Less commonly found in a solidbody electric instrument's necks are formed rods. Rather than having a dedicated anchor, the end of the rod is bent into an L-shape or other form that both anchors and renders the rod immobile. This requires the rod to be heated with a propane torch (or induction coil) and bent on a mandrel, hammered over the edge of an anvil, etc. ....a particularly notable example of a formed-end compression truss rod is Brian May's famous Red Special guitar, built by his father and himself at the back end of the 1960s. 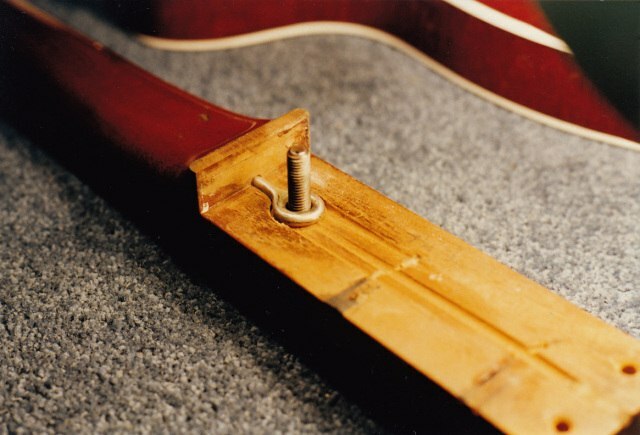 Here it can seen how the truss rod was formed into a loop which secured itself around the single neck mounting bolt. Very unique! To make pretty much any truss rod, it's necessary to master the skill of creating threads in metal. Mostly this is for the adjuster side of the rod, however in the majority of cases this is also how we fit the anchor prior to securing it. The most common question at this point is, "can't I just use threaded rod off the shelf instead?". Like anything, the short answer is "you can do whatever you want". In fact, threaded rod is probably the cheapest way to make a truss rod without need of buying any tools since all the work is done for you. The better answer is, "you shouldn't". Threaded rod is far weaker and more flexible than the equivalent diameter of full steel rod. Securing the anchor becomes more difficult. Less importantly the threading binds in the rod channel. Even though compression rods do not move significantly in use, one that does not bind is more desirable than one that fights against its normal function. For what it's worth - especially on such a permanent fixture in a neck - doing it correctly with the right materials from the outset is a better idea, especially since it's not a difficult proposition. Taps are similar to a twist drill bit. They have a spiral cutter with lengthwise flutes for ejecting waste. Unlike drill bits, a tap progressively cuts a threaded path around the inner surface of a pre-drilled hole. The taps we will be using are driven by hand rather than by machine. Powered tapping tools can be found pretty easily, however they are a magnitude of cost more than simple hand tapping tools. Dies are the opposite of a tap; they cut a thread around the outside of a specifically-sized rod or cylinder. A typical die looks like a large hexagonal nut or short cylinder of metal with various cutouts and sets of teeth in the centre. Again, for our purposes they will be the hand-cranked versions. 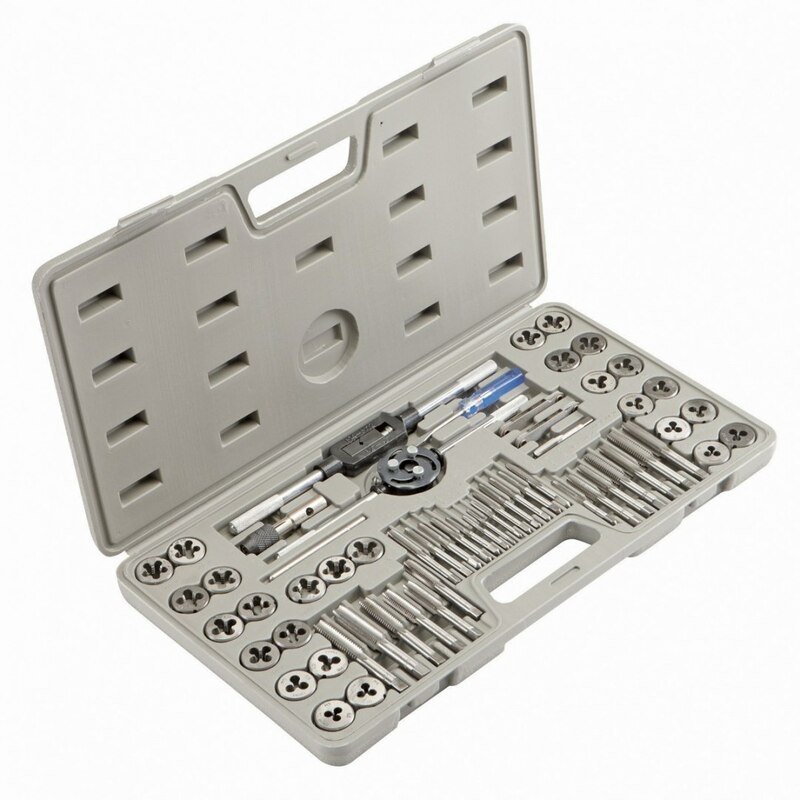 Taps and dies for hand cutting threads are fitted into small two-handed tap wrenches and die stocks. The cutter fits into the appropriate wrench/stock, is tightened up and you're good to go. Instead of "investing" in a full set of crappy taps and dies, do yourself a favour and only buy the size(s) you need and buy high quality HSS (high speed steel) from the outset. Granted, these may cost a few shekels more than an entire set of crap, however the difference in the end product is significant. High quality tools are far less likely break (unless abused) and they cut cleaner, stronger, smoother-running threads with less effort. That and they generally end up cheaper over the long run. Bite the bullet and go for the best you can lay your hands on. HSS taps/dies are much harder than carbon steel equivalents (such as those currently sold by Stewmac) which dull far quicker. The quickest test for hardness is to run a metal file over the corner of the die; HSS should hardly mark whereas carbon steel simply chowders up with little effort. Going the carbon steel route means you'll end up having to buy new taps/dies before they pay for themselves; meanwhile, good HSS tooling will continue to produce excellent results. 60pc Harbor Freight set. $40 an you might only end up using 1/10th of them, and those might crap out anyway. Mostly, the expensive versions of dies and taps look just the same as cheaper versions. Don't let this fool you! Use a bit of Google-fu to check out what quality the brands you have to hand are. Generally European is a reliable choice, plus some domestic US makers. Anything Asian is a crapshoot, but do your homework. Price is not always an indicator, however cheap always tends to be a reliable one. If you're using Metric you should stick to coarse thread pitch to match common Metric truss rod nuts. For M6 the coarse pitch is 1mm from thread to thread, or "M6/1.0mm". Imperial-size truss rods and nuts are most commonly found in 10/32 UNF ("UNified Fine thread") on 3/16" rod; 32 denoting the number of threads per inch. You have the option of cutting coarse 10/24 UNC ("UNified Coarse thread") or M6 0.5mm/0.75mm threads instead, however you'll likely have to make your own adjustment nut since they are not standard. Physically, fine threads are stronger, require less torque to adjust and allow finer control over adjustments. The downsize is that they are more prone to seizing and cross-threading than coarse. The best course of action is to decide on what adjustment nut you're wanting first and select the rest of the specifications based off that. For the purposes of the examples in the article, I decided to go for heavier Metric rod stock (M6) and use a standard coarse thread pitch. The adjustment nuts I had on stock were 10/32 UNF brass, drilled out to 5.0mm and re-tapped to M6/1.0mm. Taps come in many variations, for the various arcana of metalworking end uses. The type we want to be aiming for is a "taper" tap (also called a "starting" tap). These have a gradual starting taper which makes it far easier to locate the tool properly and start a straight-running thread with little effort. Metal swarf generated during metalworking operations can be hot, sharp and should be swept safely using a brush; don't sweep them by hand....if you thought wood splinters were bad, try removing an oily steel splinter or handling a sliced finger! Do NOT use compressed air to clear debris, and be wary when applying oil from pressurised cans such as WD40. During drilling operations, withdraw the bit periodically to allows any trapped or loaded swarf to clear from the cut. Pecking produces smaller chips which are easier to clear than long swarf which collects around the cutter. Remember that brush! 10/32 UNF - #21 /0.1590"
Drilling can be done using either a pillar drill or hand drill. The workpiece MUST be secured in a milling vice, bench vice or other strong workholding fixture away from fingers! Lower the speed on your drill as slow as it will manage. This exchanges speed for torque; crucial for metalwork. For a hand drill, a low "screwdriver" speed is sufficient. In metalwork, drill bits like to wander when starting even more than they do in wood. Establishing a starting location using a centre punch is critical, otherwise the drill will happily deflect and randomly choose it's own starting point. In the sizes required for truss rods, buying the short drill bits and chucking well into the drill collet helps prevent excessive wandering. The ideal tool for starting a hole accurately from a pillar drill is the centre drill bit. Once established, the correct size bit opens out the hole perfectly. For hand drills, a good eye and well-punched starting mark is key. Cheap but effective set of HSS centre drills. Centre punching steel rod prior to drilling. Small, but this makes all the difference. Steel flat bar punched for drilling. Starting slowly to establish the location. Easy work. All that remains is to cut this off the stock and tap it out. The same process applies to pillar drilling - allow the bit to find the punched centre. Materials such as steel and brass are relatively poor conductors of heat, and require plenty of cooling lubricant be used during drilling and tapping operations. Heat generated from friction within the cut can prematurely dull a cutter and/or change the physical properties of the workpiece. Aluminium however, conducts heat wonderfully and can be used with a simple light machine oil lubricant (WD40, 3-In-1, etc). Tap Magic or other readily-available fluids works well for all of these. For drilling, I prefer lighter cutting fluids to prevent huge lumps of grease and chips collecting and hindering work visibility. Light fluids evaporate and take heat from the cut however you need to apply them more often. For tapping, heavier grease seems to work better for me. 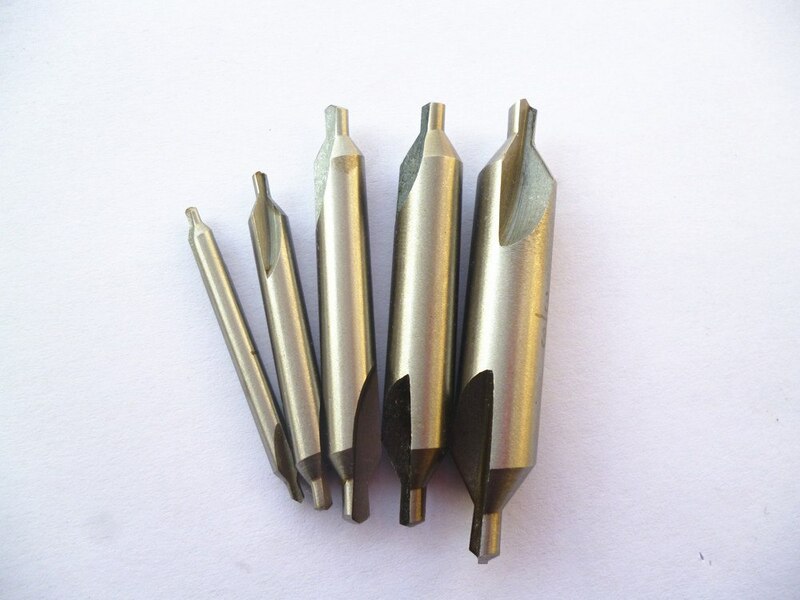 Like all materials that can be subject to plastic deformation (including wood) drilling metal carries the problem of work hardening. It is crucial that a sharp well-lubricated drill bit is used and that heat is kept to a minimum through use of coolant when required. A dull bit causes metal that should be otherwise cut and removed to be displaced instead. This compression in the walls of the cut changes the materials's physical properties from being ductile and easier to cut into a harder and more brittle form that is not. Hard brittle work-hardened drill holes are far harder to work with when tapping and easily lead to snapped taps or fragile ragged threads. Now that we have our drilled workpiece, we can move right on to tapping. For this, the appropriate tap (in this case, M6/1.0mm) needs to be fitted into a tapping wrench. These can be found in a number of "styles", however the most common is a small vice mechanism in one handle with square jaws in the centre. Start by secure the workpiece vertically in a vice and apply a generous amount of cutting grease. Carefully align the tap so that it is as parallel to the drilled hole as possible. A starter tap is more forgiving of slight misalignments. Starting a tap can be made easier by adding a light chamfer to the hole, however at these sizes I have never found it to be a necessity. Slowly rotate the tap clockwise with downward pressure until you feel it bite. This should take less than half a turn. Allow the tap to bite enough that it holds itself in place; inspect that the tap is still parallel, otherwise back it out slightly, re-align and re-advance it until it bites again. Once started, turn the tap handle one half revolution maintaining control to keep the tap running parallel. Slow and steady wins the day. Taps are an entirely enclosed operation, resulting in debris gathering up in the flutes of the tap. It is best practice to "break the chip" regularly by reversing the direction of the tap until the swarf is broken off into a chip. Chips travel along the flutes away from the cut whilst swarf grows longer, gathering around the cut and clogging the tap. Depending on the geometry of your specific tap, this may be simply a case of making a quarter or a half turn backwards until you feel the swarf chip up. Generally you should not advance the tap more than a full revolution before reversing it to break the chip. If at any point during the tapping you encounter significant resistance, withdraw the tap fully, brush debris from the flutes and apply fresh cutting fluid. Clogging, fighting the tap or initial misalignment are the most common sources of broken taps. Do not spray pressurised cutting fluid into the hole. This results in shredded metal flying out at great speed! Continue with the forwards-backwards tapping process until you run full threads through the entire length. Here, you can see that I ran the tap through until just before it bottomed out. This "chases" the thread, resulting in a clean and smooth product. Withdraw the tap and clean it up! The same process applies for cutting threads in thinner materials such as flat bar stock. The primary difference is that they are far less forgiving of misaligned starting. Whilst this doesn't affect the quality or operation of the end product, it looks crappy and in very thin stock can lose you valuable "good" threads. Fairly simple and quick, however don't be tempted to neglect chip breaking. A bit of scrap steel costs far less than a new tap. The process is relatively similar to cutting an internal thread with a tap. The important difference is that the end of the rod always needs chamfering for the threading to start reliably. Thankfully, there's a nice cheat in store. Cutting an external thread - "cutting the external threads"
Apply a good amount of cutting grease. Starting a straight external thread with a die is a little more difficult than an internal thread with a starting tap. The chamfering helps, as does moving one or both hands towards the centre of the handle. This affords greater initial control to ensure flat circular movement. A little patience and practice pays off, so by all means spend time working on scrap pieces of bar to get technique down. Once established, continue the same revolution/partial counter revolution to break chips. Looking from the top, the curls of swarf coming off the rod are visible. One quarter turn back is sufficient to break and eject them. Continue threading until the required length is achieved. If you need to remove the die to test an anchor for size, spin it off and check. Be careful when re-fitting the die not to start at an angle and ruin the work by cutting a cross thread! Check your work for cleanliness and consistency. Oil in the threads seem to make this one look less than straight....checking with an M6 nut showed it to be acceptable. Peening is the process of altering the properties of metal through deformation. In the context of truss rods, peening is used to expand the exposed thread end protruding from an anchor threaded all the way on to the rod to permanently prevent it from rotating and withdrawing backwards off the rod. Purchased rods tend to have brazed or welded anchor simply as it is cheaper for mass production. If you have experience and the equipment to braze/weld small parts, this is definitely an option. Good peening produces as adequate a result as welding or brazing. It is possible to use a thread locking compound (such as Loctite red) in conjunction with peening; realistically it offers no advantages as a properly-secured anchor should have no room to rotate anyway. The best tool for the job is a ball-peen hammer. Any hard-faced hammer can be made to serve the same function, however ball-peen hammers are smooth-faced and made of hardened high carbon steel; ideal for metal-to-metal contact. Rough faces encourage chipping and splintering, whilst softer hammer heads become damaged with use and end up with the same issues. 16oz Harbor Freight ball peen hammer. Small and light; will do the job happily. Peening is a process of many light hits around the exposed rod. Each hit gradually mushrooms out the exposed threaded end, eventually locking the anchor in place. The deformed surface can then be tapped around the face to produce a smoother consistent look (just to make you feel good). 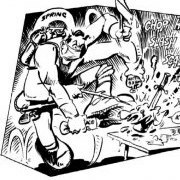 Heavy hits easily ruin the work through too much force, leading to splits and chips. First, the exposed thread end needs to either be cut or partially ground back. 2-4 thread's worth is adequate. In this instance, I measured the length of threading being cut to avoid this step. The rod should be clamped in the vice with the anchor held directly above the vice jaws; these photos were taken out of the vice for visual clarity. Taps using the flat face of the hammer around the edge of the rod at a slight angle flatten the surface and compress the material. The hammer should only contact a small area at any one time rather than landing flat and hitting a larger one. Use the ball if this is too difficult. Peened metal becomes much harder and more brittle through this process, leaving it more liable to chipping (you are wearing safety glasses, aren't you?). Attempting to peen a large amount of metal will lead to splitting and fragmenting. Here we can see the surface has compressed downwards and outwards. The anchor is already firmly locked in place. This took around 30-40 light taps. All that remains is to slowly work the mushroomed surface into a consistent rounded face using the ball. This took about as much work as the previous step. It looks great! Well done you. First, we need to cut a reasonable length of metal rod to form the slug. I made a longer length, however you can use any length from as little as 1/4" or 6mm quite easily. Longer slugs are more difficult to tap (and the tool may not be able to cut a thread all the way through) whilst a shorter slug can have less purchase on the rod from shorter threading length. Checking for the maximum effective tapping depth; about 3/4 of what is exposed from the vice jaws. A hacksaw makes quick work of mild steel....quicker if you use a fresher blade! I like to tidy up bits of metal when I'm working on them, especially sharp edges and burrs. Chuck up the slug into a hand drill, and clean up the face on a hand file. Be careful that the drill doesn't run away with you! The next step is to centre punch the slug to provide a good drill starting location. Only hit the punch once with the hammer and relocate it if you need to punch it again. They rebound out of location with each strike. The next step can be done either using a hand drill (which can be difficult to keep perpendicular) or on a pillar drill. A little wandering off-centre is no major disaster, so use what you have and worry less. These are so cheap to fabricate that you have plenty of opportunity to practice. Remember to use a good cutting fluid/grease for this operation. I used only a little thin spray lube directly on the drill bit to make photography clearer. The hole required needs to be 5,0mm, however the bit I have is long and a little flexible. To ensure the hole was straight, I drilled a 3.0mm starter hole using a short stub bit. Once drilled through, open out the hole with the correct diameter drill bit. Okay. Load her back up into the vice and chuck up a drill bit of a larger diameter than the slug. Peck drill the end until the inside meets the outer chamfer. With a three-sided (60°) metal file, open out the marks into grooves. I find it easier to make one at a time, angling the file slightly. Cutting both at one time seems more prone to slipping. Once grooves are properly established, filing can be done across pairs of grooves. Deepen them until they form sharp teeth at the outer edges. This threaded slug then just needed to be tapped to finish it up. Drill out the slug to the correct size for tapping. Start the thread - this shot certainly wasn't straight! Mating rod end, 2-4 threads longer than the slug when fully threaded on. End of the rod peened over securely. Part of my research into different approaches on making a Fender-style "slug" truss rod came up with an excellent video by Bill Scheltema. His methods are more or less in line with my own and those of other people who make this type of rod, and various points he raised certainly improve my personal approach to making this style of rod anchor. Bill's a great guy and worth spending time with what he shares. I showed you how to drill flat bar in the bench vice, so let's see one on the pillar drill. As always, measure, mark and centre punch your location. The hole is slightly further in from the edge than it needs to be, however this is no problem since it is easily filed down to size later. A bit of filing and she'll turn out a beaut. This die and stock are far better than the cheap ones I have. Night and day difference all around. Not quite enough thread yet. A little less would have been better. This does however provide a good visual reference on what is too much versus too little. This is exactly what happens when you try and peen too much material; it mushrooms out and splinters from its brittleness. The large amount of peening blows has also caused the anchor to deform slightly. This doesn't mean the anchor will not work, it's just not going to win any beauty contests. I filed a little material off the end and re-peened it. For the sake of too many threads, this took twice as long as it should have done. Not perfect by any means, but as secure as it needs to be. I'd have preferred a larger rounded end, but testing this in the vice showed it to be locked tightly. I think I'll remake it anyway since I don't like feeling defeated. Barrel nuts are the easiest parts to find off the shelf. So much so, it is simpler just to buy a handful rather than making them. 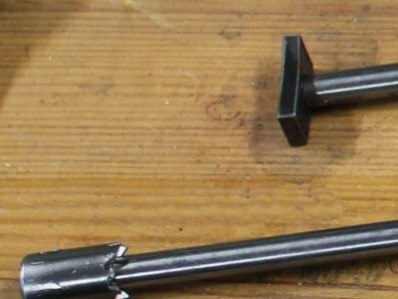 The primary difficulty with making a barrel nut is the cross drilling; it is extremely difficult and time-consuming to do unless you have a pillar drill and mill vice. Beyond that, the majority of the steps are identical to that of making a toothed slug anchor; cut to length, dress the ends and chamfer with a file, drill and tap. Here I have an aluminium barrel nut I bought for next to nothing. Despite being a softer metal, it is more than adequate for the task. The threading and peening are what provide the overall working strength. That looks like it's getting towards being a too much thread exposed for peening. It should be okay since barrel nuts peen over around the cylinder more than flat stock. 2-3 threads above the highest point is good. Barrel snugged against the vice jaws: thread starting to flatten and mushroom out. ....this is the problem with anchors that don't locate firmly in the vice! The barrel tries to rotate with hammer impacts. Perhaps this would be a good case for a thread locker or a little CA glue in the thread. Perseverance pays off. A perfectly-peened rod end. Once you've completed the anchor end, the rod simply needs threading at the adjuster end for your nut and washer of choice. The exact length of threading available to the adjuster is based on the amount of adjustment you perceive the rod to require, the length of your nut and washer, plus a couple of other design-specific values. Generally I add about an inch extra beyond where the adjuster nut would sit with the rod entirely relaxed. An inch and a half is gravy. This rod might benefit from a little extra threading. The finished item; a flat anchor truss rod. This simply needs a bearing washer (I've got some half moon washers on order at the time of writing) and for the adjustment nut to be lubricated with a little Teflon grease. A completed pair of rods. Choosing the type and exact dimensions of your truss rod is never a one-size-fits-all job, however truss rods are not difficult to fabricate if your needs are unique or specific. We need to know how to select the style of rod and derive its measurements from the instrument design. Where are the anchors and bearing points best located? How do I work in the truss rod as part of my overall building process? We'll save these answers for next time. If you have any comments or would like clarification on any points raised in this tutorial then nip over to the forums or ask in the comments below. This tutorial was made possible due to the ongoing support of our Patreon donators. If you found this publication useful; share it and talk about it! Even better, drop a couple of bucks in the Patreon hat so we can keep raising the bar with our published content. How To Make A Vintage Compression Truss Rod by Carl Maltby is licensed under a Creative Commons Attribution-NonCommercial-ShareAlike 4.0 International License. Very true Keith. 6mm or 1/4" is about the point just before the elastic flex within the rod tend to naturally induce a backbow without tensioning, plus it's easier to acquire (at least here) than 5mm rod. I think if the latter were available, I too would gravitate towards it. 10/32 adjuster nuts are off-the-shelf parts so 3/16" makes more sense unless you're willing (and able) to make or modify your own nuts. Being a bass builder more often than not, a slightly beefier rod makes sense to me; that and the router bits for cutting channels being very very standard. I loved the article. I am wondering about the rod material and whether to use high carbon steel for the rod like heavy piano wire or to use mild steel which is typically weaker. Awesome - great to hear! I can't say that I'm an expert on the properties of different steels, however I guess that if it were treated correctly prior to threading, you'd have a good shot with high carbon steel. Ultimately though, it depends on what you want from the material. Mild is more than enough for the basic needs of a truss rod, so perhaps looking at more exotic materials (not that high carbon steels are exotic) is creating more work and outlay for little or no return. I'd certainly not want to harden the threads too much after threading, however I would agree that a rod that is more durable than easily-replaceable nuts is a better option than the other way around. I can't help but consider the titanium rods that were "in fashion" for a while (likely another come and go fad?). I wouldn't convince myself over the contribution that the material has to how a neck "sounds" in service. The type of rod contributes far more I think. Again, it depends on what you want from the rod. If you've got both materials on hand, test them out and see how they hold a thread. If they break up, it might be that the carbon is acting as discrete fracture points than being in solution.